The Vatican’s delegate to the United Nations spoke is support of the recent ceasefire declared in the Russia-Ukraine conflict that has taken over 10,000 lives on Ukrainian territory since 2014. 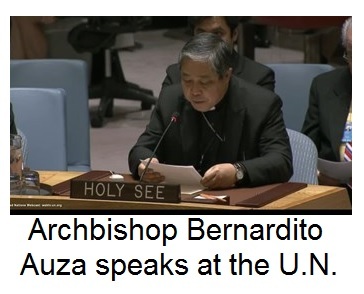 Permanent Observer of the Holy See to the United Nations, Archbishop Bernardito Auza, was speaking at a meeting of the UN Security Council, which is presently chaired by the Ukraine delegate. He called for humanitarian aid, which the Vatican has contributed toward in the past, but he also called for respect for Ukraine’s territorial integrity. The latter has been threatened and disregarded by Russia in the illegal annexation of Crimea and the ongoing separatist threat in the two most eastern provinces (oblasty) of Ukraine. Concerning the conflict in Ukraine, which continues to cause grave concern since it began in 2014, the Holy See underscores once again that all necessary steps should be taken to enforce the ceasefire and to implement the measures agreed upon. These efforts should be accompanied by the sincere commitment of all involved parties to respecting all fundamental human rights and restoring stability at the national and international levels, not least by respecting international legality with regard to Ukraine’s territory and borders (cf. 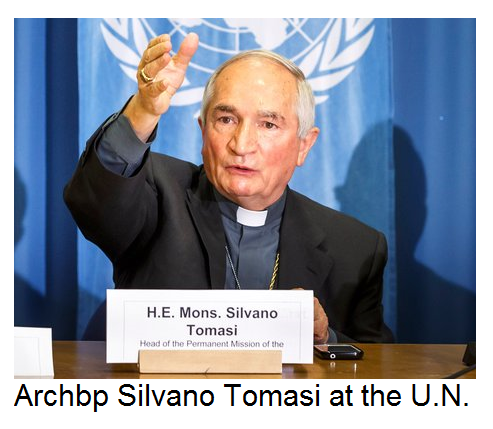 Statement of the Permanent Observer of the Holy See, Human Rights Council 28th Session, 26 March 2015*). Video of entire 21 February 2017 discussion of the UN Security Council on “Conflicts on Europe” which very often mentions with the ongoing conflict in Ukraine can be found on the UN Website in PART 1, PART 2 and PART 3. Canada addresses the Council in Part 3 at 9:00. Chairing the meeting, by the way, is the delegation from Ukraine. Notes: This is the 2015 statement of the Vatican mentioned in the more recent statement above…. With reference to the Statement made by this Permanent Mission at the 25th Session of the Human Rights Council on 26 March 2014, the Holy See reiterates its closeness and solidarity to all the people of Ukraine, whose country continues to be affected by the present conflict. With this intervention, the Holy See intends to stress once again the urgent need to respect international legality regarding Ukraine’s territory and borders, as a key element for ensuring stability at both the national and regional levels, and to re- establish law and order based on full respect for all fundamental human rights. In this regard, the Holy See welcomes the steps taken to enforce the ceasefire, which is intended as an essential condition to arrive at political solutions exclusively through dialogue and negotiation. At the same time, it emphasizes the crucial need for all parties to implement the decisions taken by common agreement, acknowledging in this context the efforts made by the UN, the OSCE and other relevant organizations with reference to the Package of Measures for the Implementation of the Minsk Agreements. The Holy See holds that the full adherence of all parties to the provisions of said Agreements is a prerequisite for all further efforts to improve the humanitarian and human rights situation in the affected territories, by, first of all, bringing an end to the loss of human life, acts of violence and other forms of abuse. It should also include the release of all hostages and illegally held persons and ensure unfettered access by all legitimate actors to provide humanitarian assistance in those areas. At the same time the Holy See is concerned about the social emergency facing the population living in the areas affected, who suffer from poverty, hunger, insecurity and health risks. It is also concerned about injured and displaced persons and families suffering from the loss of loved ones. In this urgent situation, the Holy See is committed to offering its assistance through its institutions and requests that the charitable organisations of the Catholic Church intensify and coordinate their efforts to provide assistance to the people of Ukraine. The Holy See also wishes to express its confidence in the solidarity of the international community.